Sanctuaries give animals that have been abused, exploited and abandoned a second chance. Make sure your donations are making an impact on animals in the care of a true sanctuary: those that provide high standards of care for each animal for a lifetime. As you consider donating to animal sanctuaries, consider the smart, fun and quick choice: the GFAS Donation Jar! Make a difference for 1, 2, 3 or any number of TRUE sanctuaries that care for YOUR FAVORITE species of animals at YOUR FAVORITE places. The Donation Jar makes this happen in one easy transaction and provides you with a receipt for your tax-deductible donation immediately. Choose among hundreds of species from sanctuaries located all over the world. 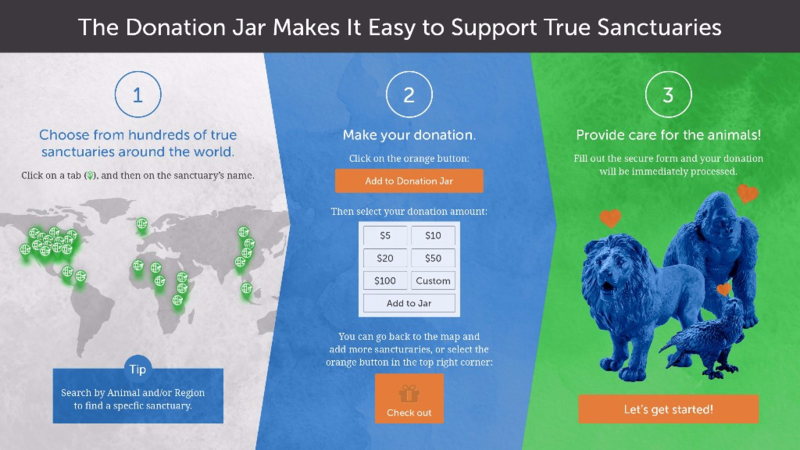 You can choose any amount and give a different amount to each sanctuary. Step 3: Repeat Steps 1 & 2! After you add your first donation to the Donation Jar, one is just not enough! Part of the fun is adding 1, 2, 3 or 33 gifts to sanctuaries to your Jar. It’s up to you! Check out is simple AND you receive an instant receipt for your tax-deductible donation!